It is clear to both the current Iraqi government, to the US government and to international and local analysts and observers that it is going to take more than aerial bombardment to weed members of the Sunni Muslim extremist group, the Islamic State, out of Iraq. In order to definitively defeat the Islamic State, or IS, group, they need moderate Sunni Muslims in Iraq to support their fight against IS – often because they are the ones living inside the cities controlled by the IS group. Attempts were recently made to convince moderate Sunni Muslims, and their armed factions, to join the fight against the IS group during negotiations held in Amman, Jordan, and in Erbil in Iraqi Kurdistan. Unfortunately these negotiations were mostly unsuccessful. A source at the US embassy in Baghdad told NIQASH that there had been secret negotiations taking place between various Sunni Muslim armed factions, via Arab and Iraqi Kurdish intermediaries, for the past three months. At the request of US diplomats and military personnel, officials from the Iraqi government have been meeting with the leaders of these groups in Erbil and Amman. US military man, General John Allen – officially the US’ Special Presidential Envoy for the Global Coalition to Counter IS – had been trying to contact the tribal factions and leaders who were his friends and allies when he was a soldier in Anbar, the source said. Allen was also the brains behind Iraq’s “Awakening Movement”, a group of Sunni Muslim fighters, funded and formed by the US government, to get Al Qaeda out of their hometowns, post 2003. There are six of what might be considered more or less moderate Sunni Muslim armed factions – and it should be noted that some are only moderate in comparison with the IS group – in Iraq’s Sunni Muslim-majority regions. These are the Islamic Army in Iraq, the Mujahideen Army or Jaysh al-Mujahideen, the Jaysh al-Tariqa al-Naqshbandia militia also known as the Naqshbandi Army, the 1920s Revolution Brigades, Ansar al-Islam and the biggest of these groups, the Military Council of Iraqi Tribal Revolutionaries. When the IS group took control of certain Sunni Muslim-majority areas in Iraq, long running disputes with, and locals’ anger towards, the Shiite Muslim-led government in Baghdad meant that at first, the IS fighters were welcomed. Many locals in these areas saw them as liberators from the Iraqi army – which was heavily Shiite Muslim and which Sunni locals had accused of treating them unfairly, beating, imprisoning and arresting them – and basically “occupying” the Sunni-majority areas. For both the locals, the various Sunni Muslim armed factions and the IS group, there was a common enemy: the government in Baghdad. After several months in charge though, the IS leadership started making demands of the other Sunni Muslim groups, who had helped them seize control of some of the Iraqi cities: pledge allegiance to us or be considered an enemy. Many of the Sunni Muslim militias refused to do this – perhaps partially because, there were some major ideological differences. For example, the Naqshbandi Army is led by former military officers who served under Iraqi leader Saddam Hussein and who most likely subscribed to the nationalist, Arabist, secular doctrine of Hussein’s Baath political party. They were the opposites of those most likely to impose Sharia, or religious, law. At this stage conflict began to arise between the IS group and some of their alleged allies. Members of the militias have staged assassinations of IS fighters in Anbar province, in Mosul and in Kirkuk. 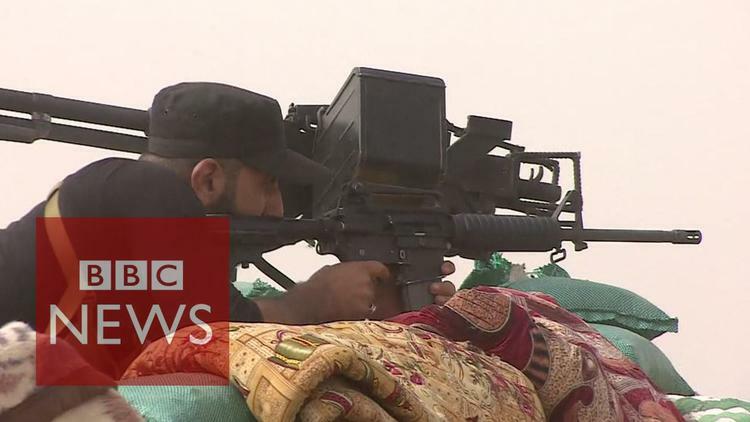 The IS group recognised the danger and cracked down hard on dissent, arresting some of the Sunni militias’ senior leaders in places like Hawija. However there are problems – these Sunni Muslim groups don’t have the weaponry to tackle the IS group by themselves. At the same time they are fearful about cooperating with the new government in Baghdad. Again it is led by a mostly Shiite Muslim coalition and a Shiite Muslim Prime Minister, Haider al-Abadi, and they fear that history will repeat itself and the government will betray them, in the same way it betrayed members of the aforementioned Awakening movement, which General Allen helped create. Although the Awakening troops were supposed to be incorporated into the Iraqi army proper, this never really happened and the former fighters were left unpaid and in limbo. The leaders of these kinds of Sunni Muslim factions have been avoiding public exposure, shying away from official media appearances. But if one knows who they are, their movements can be seen online, on social media like Facebook and other websites. Usually they write that they are against murder and random violence and that they oppose the IS group. The most strategic areas controlled by Sunni Muslim militias border on Baghdad to the north, west and south. While the Sunni Muslim militias say they are only acting in a defensive role at the moment, the IS group is certainly attacking the Iraqi army and Shiite Muslim militias in those areas. Al-Jumaili explained that groups like his are trapped between two difficult choices: support the IS group, or support the Shiite-led government. Which is why groups like his are remaining relatively quiet and staying as neutral as they can. “The government should withdraw Shiite Muslim militias from our [Sunni Muslim] cities, stop its random shelling of innocent people, compensate people for the damage done to them, bring the displaced people back to their cities and withdraw its army outside Sunni cities,” al-Sawbaei presents his admittedly difficult wish list for joining an anti-IS alliance. The new government in Baghdad has tried to meet some of these conditions – but it has found it difficult to carry out promises like stopping shelling of civilian areas (these were halted, then resumed) and to force Shiite Muslim militias to withdraw from Sunni Muslim areas (the militias are not under government orders). This has left a bad impression on Sunni Muslim militias who feel they cannot trust the government, al-Sawbaei notes. Sunni Muslim areas have become battlegrounds, the two militia leaders, al-Sawbaei and al-Jumaili, say. Thousands have been displaced and buildings have become rubble. And as they see it currently, there seems to be no solution to this ongoing disaster. So they are looking after their own and remaining neutral.